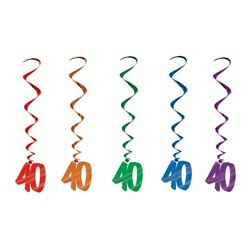 Celebrate a 40th birthday or 40th anniversary of your company with packs of 40th Whirls. These fun and colorful dangling decorations make the perfect accent to your ceiling decorations and will coordinate with many of our products. We carry 40th themed signs, napkins, confetti, coasters, centerpieces, streamers, and buttons. Everything you'll need to plan the perfect party. I'm not big on a ton of decorations, but these will be great along the ceiling over our half wall.